Whenever people talk about milk, and their choices in regards to this dairy product, it gets very personal, very quickly. Whether you were breast-fed or formula-fed, many of us transitioned to dairy milk as soon as we were toddlers. So it’s understandable that we hold it near and dear to our hearts, even if we drink almond milk or coconut milk today. One of the key questions these days is whether we should hand over the extra cash for organic milk. It’s important to know exactly what we’re getting when we buy organic milk vs. non-organic milk (which we’ll call “conventional” milk for the purpose of this story). 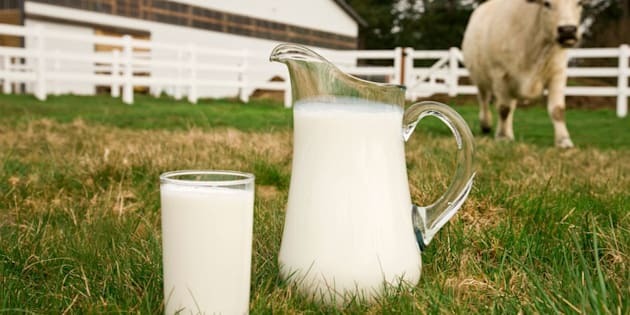 According to strict organic regulations put in place by the USDA, organic milk must come from a cow that has not been treated with antibiotics, has not been given hormones ― for either reproduction or growth ― and has been fed at least 30 percent of its diet on pasture. (That’s the minimum ― farmers in more temperate regions are expected to let their cows graze on pasture for as long as possible.) The rest of the cows’ feed must be grown without chemical fertilizers, pesticides or genetically modified seeds. Conventional milk could be produced in the same way that organic is, but it doesn’t have to be ― it’s not held up to the same strict guidelines. According to the USDA organic guidelines, organic milk comes from a cow that has not been given antibiotics. If a cow at an organic dairy farm does have to be treated with antibiotics, the farmer can no longer use her milk. That’s it. “It’s not that we don’t believe in antibiotics, we’re just going to do everything we can to not use them,” Marquez explains. “There are strict standards in place to ensure the milk you buy at the store is safe,” Jordan explains. “Milk is tested for antibiotics at each stage of the delivery process — from the farm, before it is transported and again at the dairy processing facility,” Jordan explains. One hormone that’s used in some dairy cows is a synthetic bovine growth hormone known as rBST ― though this practice is increasingly less common. “In fact,” Marquez points out, “do you know that we dumped milk this year in 2016? We dumped it down a drain.” Because of a massive glut in 2016, 43 million gallons worth of milk was dumped in fields, manure lagoons or animal feed, reported the Wall Street Journal. Reproductive hormones, Marquez says, are commonly used in large conventional dairy farms (but not organic farms) to ensure efficient breeding during artificial insemination (AI). AI is common practice in both conventional and organic operations, and it’s expensive. The hormones for reproduction that are used on conventional dairy farms include prostaglandin, gonadotropin releasing hormone and progesterone. They’re hormones naturally produced by the cow during reproduction, but are now injected into them at specific times for a more controlled and efficient reproduction result. Here’s the kicker. Even if you like the sound of organic milk, its practices come at a price ― a steep one. Walk into the milk section of any grocery store and you’ll find that organic milk is sometimes double the price of conventional milk. That makes this choice a challenging one for most, and a choice that some people don’t even have the option to make.